When JD interviewed Maura to find out more about her practice, it became evident that here income was restricted by the number of hours her office was open. When looking at Maura’s website, JD could see that the “brand persona” didn’t match the incredible skills and expertise that Maura had. In John’s words, Maura’s website looked like a Toyota Sedan when it should have been more like a Mercedes Benz. 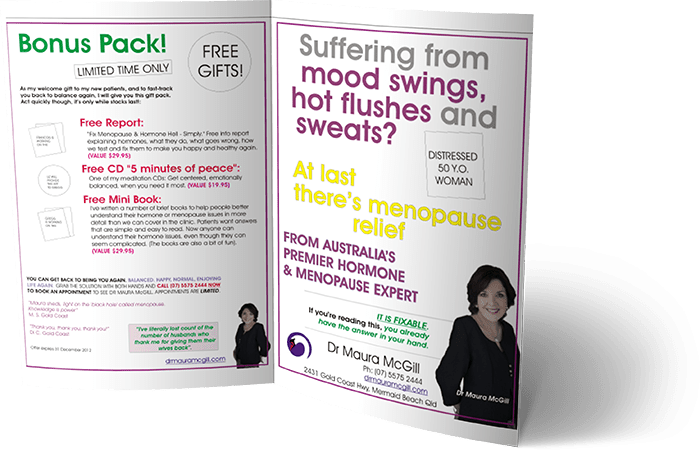 Maura knew that menopause issues were a growing concern among women over 40 and was frustrated that many of her clients complained about her very moderate $75 per consultation fee. When John investigated the demographics of Maura’s clients, he found that a lot of them came from working class suburbs and were therefore, very, very mercenary when it came to spending money on themselves. John’s solution was a stark but simple one. 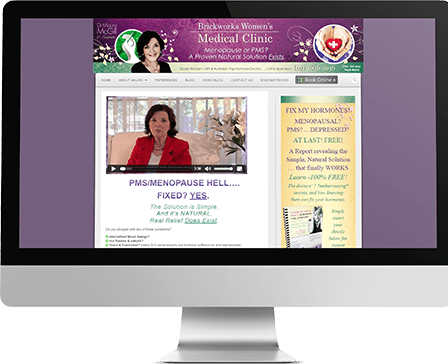 He recommended that he design and create a new website for Maura, one that positioned her as “the Mercedes Benz” of menopause experts (a tag she richly deserves by the way, as she is a genius at helping women with such issues, via natural remedies). Her Natural Hormone Replacement Therapy has been proven to be quite miraculous and she has helped literally thousands of women overcome the frustrations of hormone imbalances. After John had dramatically lifted the “look and feel” of her website, he recommended that “letterbox brochure marketing” take place – but targeting the wealthier suburbs within a short drive to her clinic. Direct initial traffic to her website, so that prospects would be hopefully convinced of her remarkable skills. 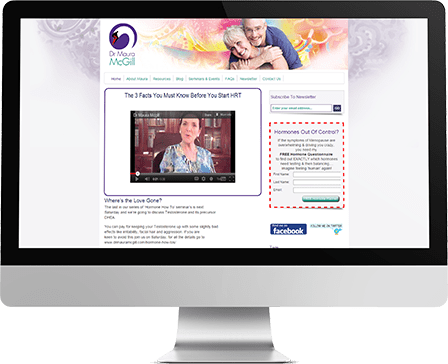 When women visited her new website, they were given the opportunity to download a Free Report on “Fix My Hormones” – providing Maura with valuable additions to her database. The result of this combination of online and offline marketing techniques was that Maura was immediately booked out for weeks – and she was able to increase her consult fees from $75 to $150! Yes, she DOUBLED her rates and during the first month (doubling her income, by the way!) and she only had one or two comments about the increase in price. This is because she was attracting a different level of clientele, women from wealthier suburbs who didn’t look at her fees as closely as women from working class suburbs would have. A classic lesson in “message to market” match. 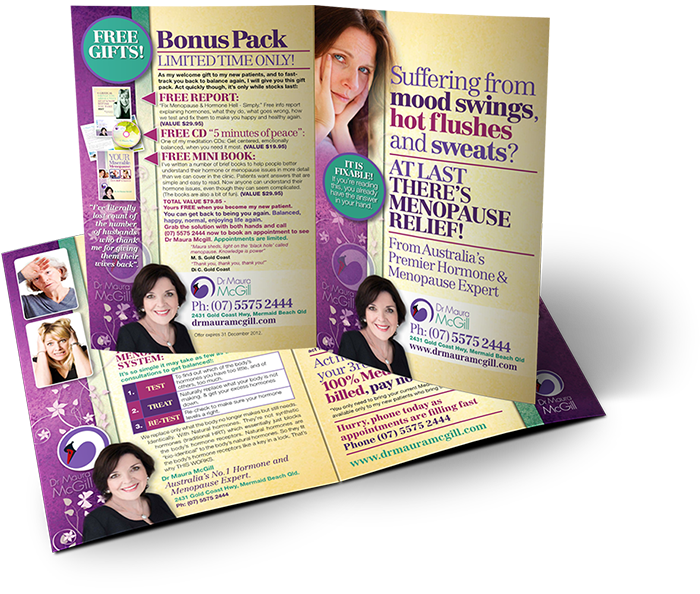 Maura’s incredible skills at helping women with menopause issues was not reflected in her old website. The overall tone, design and ambience of her old website made her medical clinic look rather downmarket, therefore never really appealing to a high income prospect. The moment her website was refurbished and positioned as the Rolls Royce of her profession, it was a perfect comrade for the letterbox brochure campaign she launched. See What Dr. Maura Has To Say About JD. JD is now working with Maura on developing an online program called, “Fix My Menopause,” a helpful video and e-book training package which can be purchased by women anywhere in the world and immediately downloaded. It’s an exciting program where Maura is now taking her skills and knowledge to the world as anyone from all four corners of the globe can access her advice and recommendations. JD has helped Maura produce various videos which are part of the package, with parts of these videos being a “fly on the wall” look at a typical doctor and patient meeting. We see Maura meeting with patients two or three times and providing them with recommendations based around natural hormone replacement therapy. If you’re in a “services industry,” this case study should be music to your ears. Even if you have a limit on the number of hours you can work, there are ways you can increase your fees quickly and efficiently.